As I've gotten older and had less time to play large scale wargames, I've had more and more thoughts of a smaller game that could be played that was also more accessible to non-gamer geeks. I even did a post about it, hoping for a return Warhammer Quest. That hasn't happened, but Mantic Games has answered the call with Dungeon Saga: the Dwarf King's Quest. The basic premise is a staple of RPGs: a small band of adventurers must fight their way through a dungeon to stop a villain's evil plan. 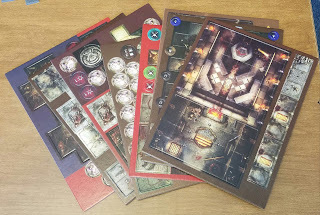 Originally I imagined playing with with adults, but now as my kids are getting older (currently 7 and 4), they will be interested in this sort of game as well. 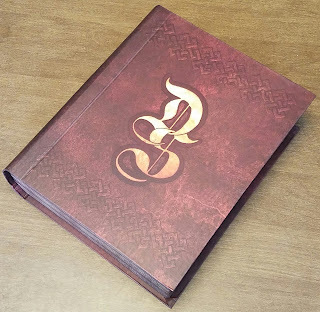 When Dungeon Saga arrived at my door, I opened it up to see what's inside. The main box is a sleeve that fits over another box that looks like a book, giving the gamebox an appearance of a ancient tome of wisdom. 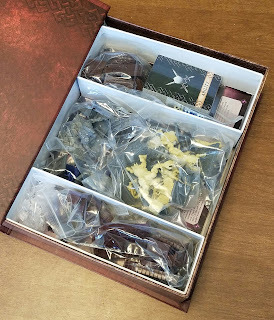 Opening up the "book" reveals a contents: miniatures/game pieces in plastic bags, two decks of cards, dice, and underneath all the cards and rulebooks. 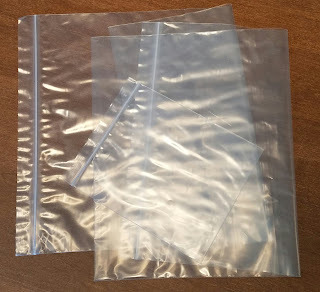 They are separated by two dividers that you could throw away, but would be wiser to keep in order to keep things organized. The "furniture" game pieces are doors and barrels and such, and are in little ziploc bags for reusability. The dice have their own bag as well. 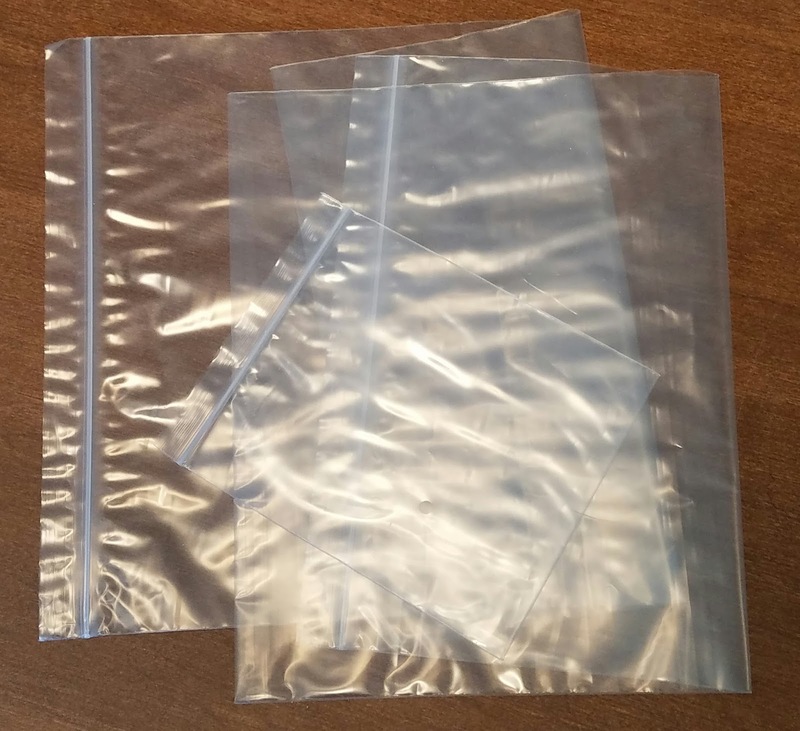 The miniatures are in other bags that you have to break open. 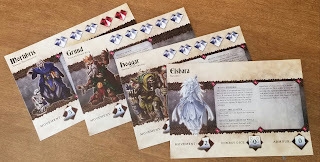 The miniatures themselves are all single piece, meaning no assembly required. This is a plus for those who want to dive right in. 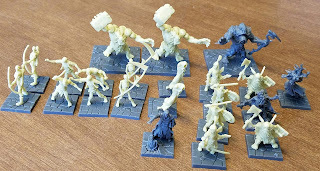 It really gives them a "game piece" feel to them, rather than a "miniature" feel. 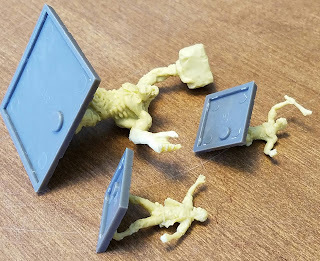 The miniatures themselves are made of a soft plastic that is easily deformed (a handout in the game actually tells you how to shape the miniatures using hot water if you want to repose them). 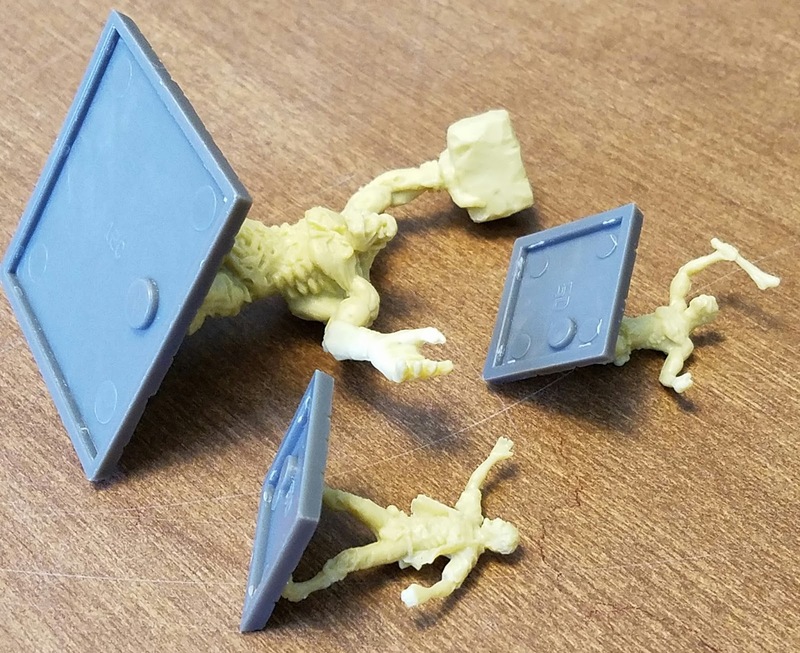 For those of you who were hoping for GW-quality hard plastic miniatures, look elsewhere. That said, once painted up, these miniatures will look just fine. If you're the type looking more for a board game than a miniatures game anyway, they are more than adequate. 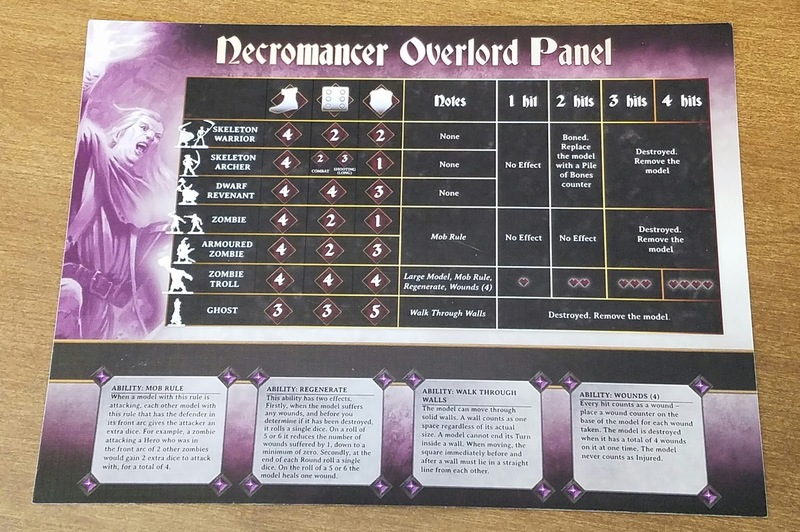 The bad guys come in a variety of creatures, including zombies, ghosts, skeletons, three larger monsters, and the Necromancer Overlord Mortibris. 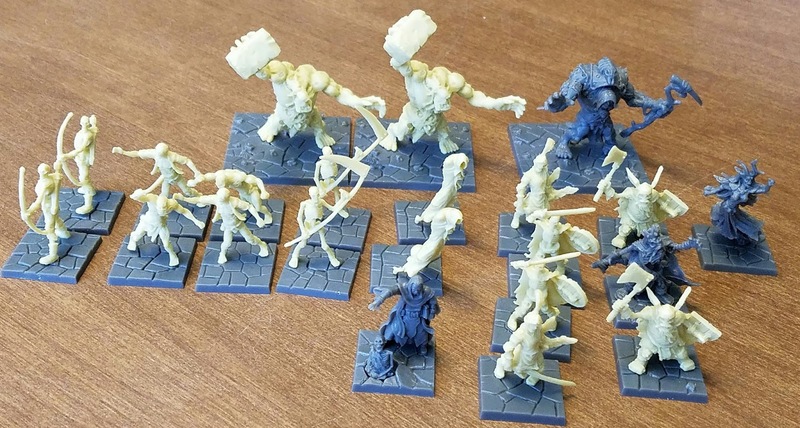 The quality of the bases are some lacking as well--like the miniatures they are soft plastic, and each miniature is permanently attached to them by a single foot. 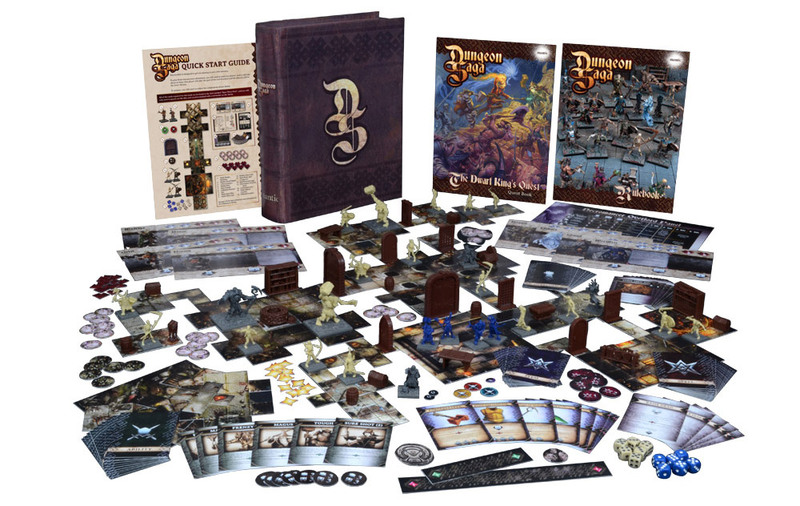 Again, this is good news for board gamers who just want to play, but to a miniature gamer, this seems like low quality. But as I mentioned above, once painted, the unpracticed eye won't be able to tell the difference. 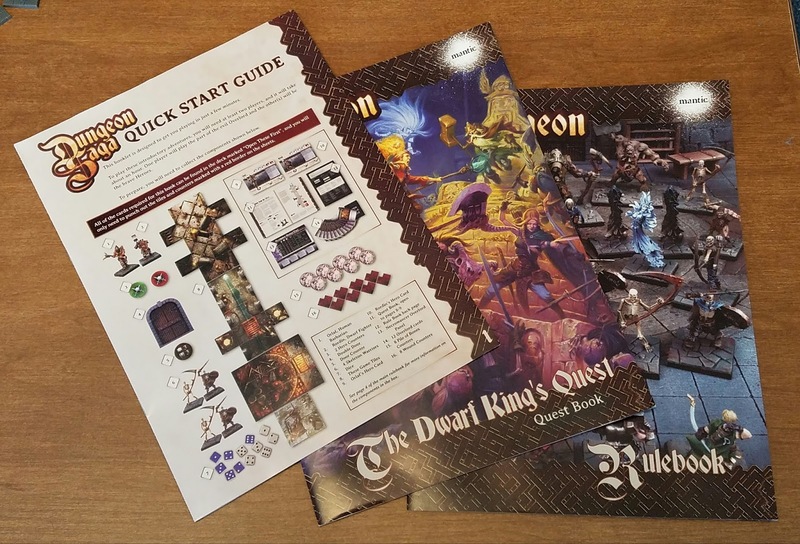 Three rulebooks are provided: a Quick Start Guide, a Rulebook, and a Quest Book, which details the scenarios. Each hero has its own card, detailing their stats. The Villains get the game treatment. 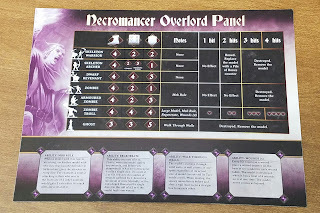 The Overlord player gets a reference card called the Overlord Panel, which has the stats of all the various monsters, and includes a damage table when those monsters inevitably get killed by the heroes. 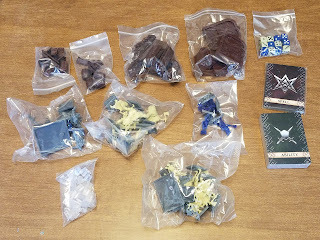 A nice added tough is the inclusion of some plastic bags where the miniatures, cards, counters and floor tiles can be stored. It's little additions like this that show that the company put some thought into the packaging. Finally, the last part of the box contents is the floor tiles and counters. 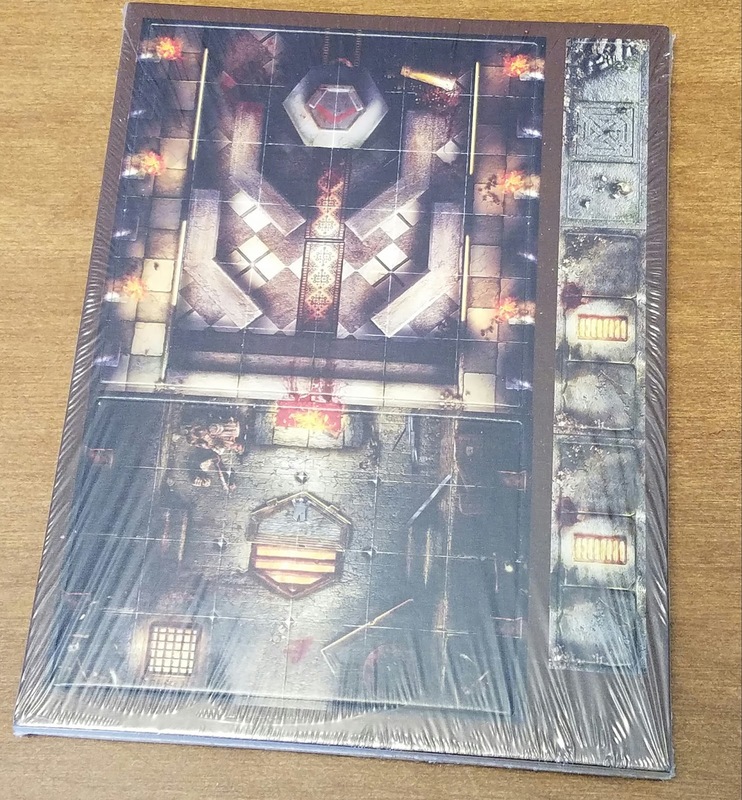 They are of decent quality cardboard, which a matte finish rather than the standard glossy of GW board games. 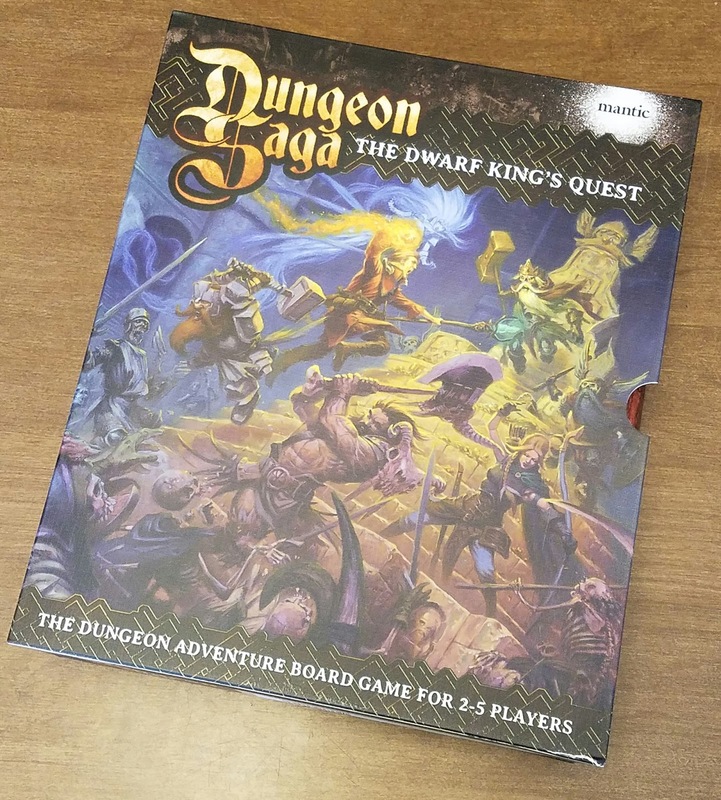 In conclusion, while not the over-the-top quality of the GW line of board games like Space Hulk, Dungeon Saga is of serviceable quality and should provide lots of fun games. In glancing over the rules, they look simple enough for my 7-year-old to grasp, and my 4-year-old should have fun as well, with some coaching. 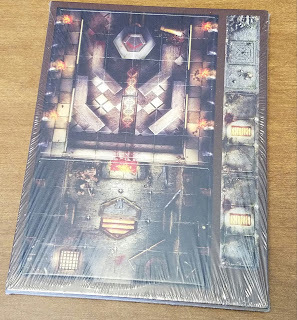 I'm looking forward to playing this game with my family--once I do, I'll be sure to do a recap to describe how it goes.